Abstract. A performance expectation is that Earth system models simulate well the climate mean state and the climate variability. To test this expectation, we decompose two 20th century reanalysis data sets and 12 CMIP5 model simulations for the years 1901–2005 of the monthly mean near-surface air temperature using randomised multi-channel singular spectrum analysis (RMSSA). Due to the relatively short time span, we concentrate on the representation of multi-annual variability which the RMSSA method effectively captures as separate and mutually orthogonal spatio-temporal components. This decomposition is a unique way to separate statistically significant quasi-periodic oscillations from one another in high-dimensional data sets. The main results are as follows. First, the total spectra for the two reanalysis data sets are remarkably similar in all timescales, except that the spectral power in ERA-20C is systematically slightly higher than in 20CR. Apart from the slow components related to multi-decadal periodicities, ENSO oscillations with approximately 3.5- and 5-year periods are the most prominent forms of variability in both reanalyses. In 20CR, these are relatively slightly more pronounced than in ERA-20C. Since about the 1970s, the amplitudes of the 3.5- and 5-year oscillations have increased, presumably due to some combination of forced climate change, intrinsic low-frequency climate variability, or change in global observing network. Second, none of the 12 coupled climate models closely reproduce all aspects of the reanalysis spectra, although some models represent many aspects well. For instance, the GFDL-ESM2M model has two nicely separated ENSO periods although they are relatively too prominent as compared with the reanalyses. There is an extensive Supplement and YouTube videos to illustrate the multi-annual variability of the data sets. 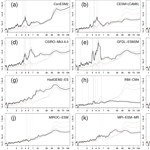 How to cite: Järvinen, H., Seitola, T., Silén, J., and Räisänen, J.: Multi-annual modes in the 20th century temperature variability in reanalyses and CMIP5 models, Geosci. Model Dev., 9, 4097-4109, https://doi.org/10.5194/gmd-9-4097-2016, 2016. 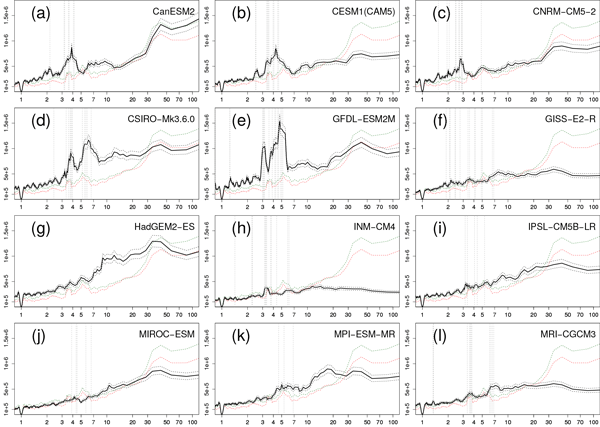 This study compares the 20th century multi-annual climate variability modes in reanalysis data sets (ERA-20C and 20CR) and 12 climate model simulations using the randomised multi-channel singular spectrum analysis. The reanalysis data sets are remarkably similar on all timescales, except that the spectral power in ERA-20C is systematically slightly higher than in 20CR. None of the climate models closely reproduce all aspects of the reanalysis spectra, although many aspects are represented well.